Why place Services Ad in Mathrubhumi Newspaper ? Under the category of Services, advertisers can launch ads for various services they offer. In day to day life, people might require the services of private investigators, pest control, catering, dance and fitness instructors, and myriad other conveniences. 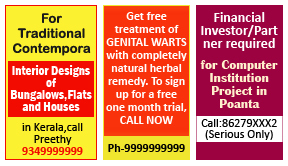 Advertising in Mathrubhumi’s Service column is sure to get your ad noticed, and ingrained in the mind of people who might urgently require your services. 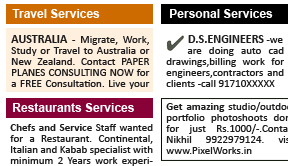 How To Book Services Ad in Mathrubhumi Newspaper ? Book ads and view advertising rates for Mathrubhumi services ad!